Winner of the 2011 Newbery Award. Start reading Moon Over Manifest on your Kindle in under a minute. "Ingeniously plotted and gracefully told." 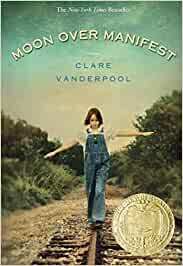 Moon Over Manifest, Clare Vanderpool’s first novel, is set in the fictional small town of Manifest, Kansas, which is based on the real southeastern Kansas town of Frontenac, home of both of her maternal grandparents. Drawing on stories she heard as a child, along with research in town newspapers, yearbooks, and graveyards, Clare found a rich and colorful history for her story. Clare lives in Wichita, Kansas, with her husband and their four children. I enjoyed every minute of this book. It was well written and fast paced. A great read for both the young and old. Reason for Reading: I am reading all the Newbery winners. Simple perfection. When I see that Newbery sticker on a book, this is what I expect. A book that truly is a wonderful story that will appeal to kids. A story that catches your attention from the first chapter. One with characters who are interesting, unique and you either love from the start or they eventually win you over at some part. I truly enjoyed every minute of this book and was sad when it came time to close the book on Abilene, Jinx, Miss Sadie and all the rest of the characters in Manifest, Kansas. Set in 1936, Abilene Tucker, who has grown up as a vagrant train rider with her father, is upset when he sends her to Manifest, a town he spent a spell in his youth to stay with a friend for the summer while he supposedly works a job, not appropriate for a young lady to be around, now that Abilene has turned twelve. Here Abilene makes two friends and finds a hidden cigar box with mementos and letters from 1918 under the floor boards. One is a map of Manifest, there is mention of a spy and the girls set about to find out who the spy was in their town back during WWI and if they are still here. They also come upon the legend of "The Rattler" who wanders the dark forest at night. Is the Rattler the spy, or someone/thing else? As the girls read the letters we are transported back to 1918 on the war front in France as the letters are from a local boy to a friend named 'Jinx'. We also are taken back to 1918 on the home-front through Miss Sadie, a diviner, as she tells Abilene stories when she comes over to work her garden to repay a large pot she broke snooping about one night. The story switches perspective between the present, 1936, through the first person narrative of Abilene and the past, 1918, through Miss Sadie's stories, a newspaper column and the letters. A rich engaging story that while not directly linked to any historical events does place one smack dab in the past and creates a good vision of living in a small town during the depression and during World War I, along with an impression of what it was like for a young soldier in the trench warfare of France. Topped off with a large cast of eccentric characters this is a gem of a story. This will be one of the rare modern Newbery's that I think will still be read decades down the road like perennial favourites "Caddie Woodlawn" and "Sounder". 5.0 out of 5 starsMore than expected! I ditched the book for a short period of time. But then as I always do,I started it again. I kept reading, and I was delighted to find out that the later parts of the story was really fun to read. I loved having the clues come together, into a very unexpected story. There was adequate sorrow in the story. I would reccomend this story to anyone, who like reading. Not just history fiction, but anything. I guarantee that this book will be fabulous. 5.0 out of 5 starsUnforgettable, excellent book! Fantastic book! My daughter is a Seventh Grader and a bit older than the recommended age of "8-12", but I think that older readers might get even more out of the rich material in this book. The story paints a vivid picture of a small town that could stand for many in the U.S., and manages to convey the living conditions, attitudes, and historical circumstances of two historical time periods. Immigration, working conditions, class differences, economic hardship, drought, and community spirit are all addressed in an amazingly engaging story line. The center stage goes to love, kinship of all kinds, friendship, and understanding. Once the characters overcome their isolation into ethnic groups and find their common humanity, they form a community that is more than the sum of its parts, just like the USA (in my opinion as an adult European immigrant to this country.) A true insight into the famed "melting pot" of America, showing its challenges and triumphs. Once my daughter was done with the book, my husband and I devoured it. We couldn't put it down! It was a great chance to talk to our daughter about what we would call "Americana" of earlier time periods, as older cultural contributions relate to the story line: Burl Ives and his song "The Big Rock Candy Mountain", and Tennessee Ernie Ford's "16 tons." HIGHLY RECOMMENDED!!! 5.0 out of 5 starsEngaging both as mystery and as tale of a time - or two- and a place! I finished this book over spring break, and thoroughly enjoyed both the story and the writing. Vanderpool uses a narration technique that I enjoy: two different narrators from two different eras telling two different stories about the same place and theme. The book is set in late-Depression-Dust Bowl Kansas and the narrator is a twelve-thirteen year-old girl exploring a town that her father had lived in. The book then moves back to 1917 and the narration is in third person. The tale then jumps back and forth between 1937 and 1917-1918, both plots advancing with clues about possible connections. The writing is solid, the characters believable, and the story is engaging. Vanderpool develops her characters through dialogue and action and less through direct description. The book is aimed at young adults, but the content matter and writing easily engages adults. All in all, an excellent read! Abilene Tucker, a twelve-year-old girl, who has lived most of the life on the move with her father, Gideon, arrives in Manifest, Kansas, her father's 'home town' very unsure about whether she wants to be there. While checking out the former saloon/church that she will be living in, she discovers a hiding place under the floorboards in her room. Inside the hiding place is an old cigar box containing some letters and a few odd objects of seemingly no value. When Sister Redempta, the local school teacher and midwife, assigns Abilene to write a story, due in the fall, Abilene has a hard time believing that this town is any different than the dozens of other towns she has past through. She soon learns differently. A run-in with the local Hungarian 'diviner' leads Abilene eighteen years into the town's past and into the life of a young boy named Jinx and his friend, Ned as well as a town full of people each with their own story to tell. A powerful story about the power of a story to connect people despite all their differences. This book integrates present and past as smoothly as any I've ever read. In fact, the characters from the past almost overshadow the characters in the present. Almost, but not quite. This is very much Abilene's story about family and hope and community. The main theme, I felt, was about how human beings often make assumptions that prove to be incorrect and only by taking the time to look deeper can we truly get to know each other. The writing becomes secondary to the journey the reader makes, hoping, like Abilene, to find a place called home. I find this book very much worthy of the Newbery Medal that it received. It's often difficult to pinpoint exactly what it is that distinguishes a good book from a great one. It might be a spark of originality even if the book covers the same basic themes that have been covered countless times before. It might be a depth of character that makes fictional people seem like our own very real quirky, aggravating, but basically likable friends, family and neighbors. It might be a firm sense of place that feels real, a place where people actual might put down roots, a place that almost becomes a character itself. Or it might be - as in Clare Vanderpool's MOON OVER MANIFEST - a combination of all of the above plus much more. The story starts with young Abilene Tucker, a motherless girl sent by her father Gideon to stay in the Town of Manifest, Kansas while he pursues employment in Des Moines, Iowa. In her father's absence, Abilene realizes how little she really knows about Gideon. She hopes to fill that hole (and the matching hole in her heart) by "finding" him in Manifest, because she knows the town holds special connection for Gideon, although what that connection is seems to be awfully elusive. The first hopeful hint comes in the form of a box Abilene discovers beneath the floorboards in the room she occupies in Pastor Shady Howard's place - a place that is part saloon, part church. The box contains several trinkets and a package of letters from Private Ned Gillen to "Jinx". Abilene is a bit disappointed, as she thought the box might have been Gideon's. Nevertheless, along with newfound friends Lettie and Ruthann, she begins tracking down the various mysteries presented in the letters - starting with the identity of "The Rattler - and piecing together stories of Manifest's past through local residents and through reporter Hattie Mae's "News Auxiliary" articles from the year 1918. But the townspeople are a little - or a lot - closed-lipped. Even Shady is a bit slippery, and there's only so much to be learned from the brief news articles. It's not until Abilene finds herself on the "Path to Perdition" to Miss Sadie's Divining Parlor that she really begins to put the pieces together. Much to Abilene's dismay, Miss Sadie tells her the story of Jinx, not the story of Gideon. Despite herself, however, Abilene (and her friends) soon becomes hooked on the story of the mysterious, affable yet hapless youth who made his appearance in Manifest in 1918. The book alternates between Abilene narrating events of the present, Miss Sadie narrating events of 1918, clips from Hattie Mae's "News Auxiliary" and letters from Ned to Jinx, each new piece giving us tantalizing new pieces of the puzzle of the relationship between the two boys, the connection to the Town of Manifest, and the relevancy to her own life. Ms. Vanderpool has created a masterpiece of a narrative. The book is engaging from page one. Manifest is an enticing mystery - one that we want to peel back layer by layer and savor like a butter-soaked artichoke. Before the book opens, there is a list of characters - those from 1918 and those from 1936. From this list we learn that in 1918 Shady Howard was a saloon owner and bootlegger, and by 1936 he is Pastor Shady Howard, "still a little shady". From the beginning he is one of the most intriguing characters and perhaps the key to this town that is more than it appears to be on the outside. The story itself is a heartwarming tale full of hope, as the town comes together to loosen the stranglehold of greedy mine owner Arthur Devlin. It is also the story of the tragedy that corrupts that newfound solidarity. It is a tale of suspicion of outsiders and provincialism. It's a tale of love and loss. And it's a tale of the rekindling of hope that just one young girl can spark. While there are plenty of suspicions and accusations, there aren't any real villains to this story (with the possible exception of Arthur Devlin, but even he's just a businessman doing business), and there are no heroes. All the characters have their faults and warts, but deep down, they're just people, mostly decent people, just trying to make it in the world. It's only when they rise above their suspicions and fears that they become more than the sum of their parts. Their faults turn to assets and their decency rises to the fore. The realism of this book is also helped by the way Ms. Vanderpool weaves in actual historical events, including the "Great War" and the 1918 flu epidemic. All the elements, historical and fictional, weave together to create a truly satisfying tale complete with adventure, schemes, love, loss, tragedy, redemption and people you can love. You might just find yourself wanting to move to Manifest. Highly recommended for kids age 8 to 108.